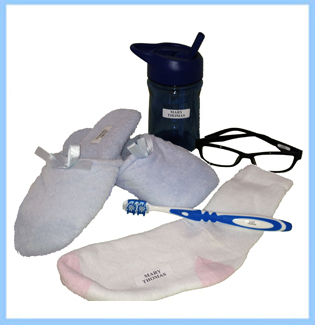 Applied Labels™ : 1.5" x 0.5"
Mini Applied Labels™ : 0.7" x 0.2"
Classic Iron-Ons: 1.5" x 0.5"
Shoe Shields™: 1.77" x 0.59"
Nursing home packs include labels to help you keep up with clothing, shoes and other belongings. For personal items use our Classic or Mini Applied Label™. On socks and underwear, use our Classic Iron-Ons. Packs also include Shoe Shields™ - clear protective covers for use in shoes. Ordering Tip: if an icon is chosen, labels will print with the name as two lines and the icon to the right, as pictured above. The only exception is for very short names (under about 12 characters). For video instructions and how to apply Shoe Shields™ and Clothing Backers, please visit our Instructions and FAQs page. Our personalized name labels are great for nursing homes. The label packs provide durable, dishwasher-safe and laundry safe iron-on or stick-on labels for shoes and clothing.